It's been a terrific week; I have been dreadfully ill, but not so ill that I couldn't eat a two-month ration of caramel-plugged Hershey's Kisses in one sitting. Don't you know, I wasn't actually sick when I ate the Kisses. I became sick the next day or something - why split hairs? - and the only obstacle between me and more Kisses is my fear of the unknown. Will I die if I eat an entire package? Or will I be as a god, knowing good and evil? Hard to say. I see one packet with a little bit of chocolate left on it. Caramel filled Hersey's Kisses are health food. I only count about nine foil wrappers. I'm impressed. 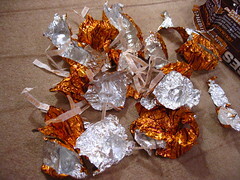 There's no way I could survive two months with only nine Hershey kisses, with or without caramel. You only get to be a God if you overdose on jujubees. I've almost finished a half pound off them now. You will die eventually either way. The question really is why would anyone want to die without ever having eaten a whole bag of kisses? That would be sad.